We just finalized a sales contract on our house! It will be sad to leave this beautiful property that we have put so much work into. At least we have until May 31st to enjoy our home. Then we can move on to our new adventure – living a self-sustainable lifestyle in Tucson, maybe even building an eco-house?! 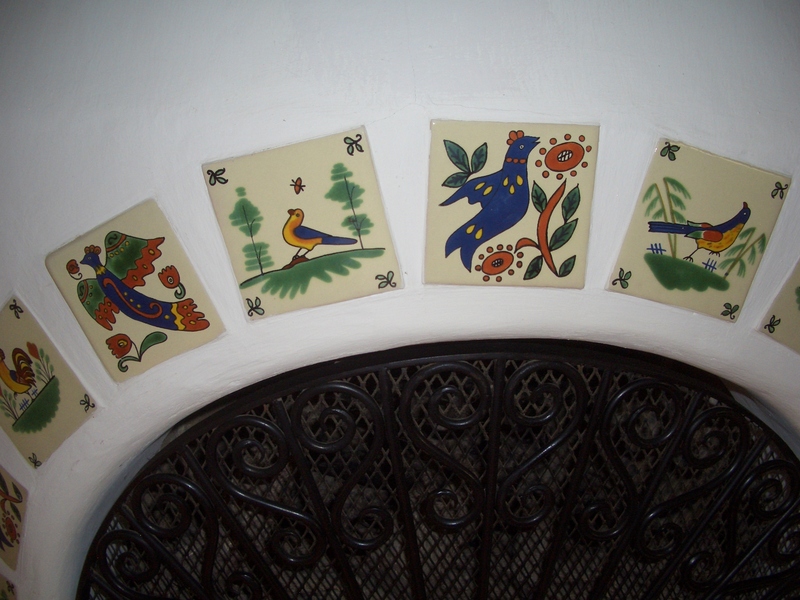 This is just a sampling of all the various designs and patterns of Talavera tiles that our property has throughout the main house, casita, and exterior areas. 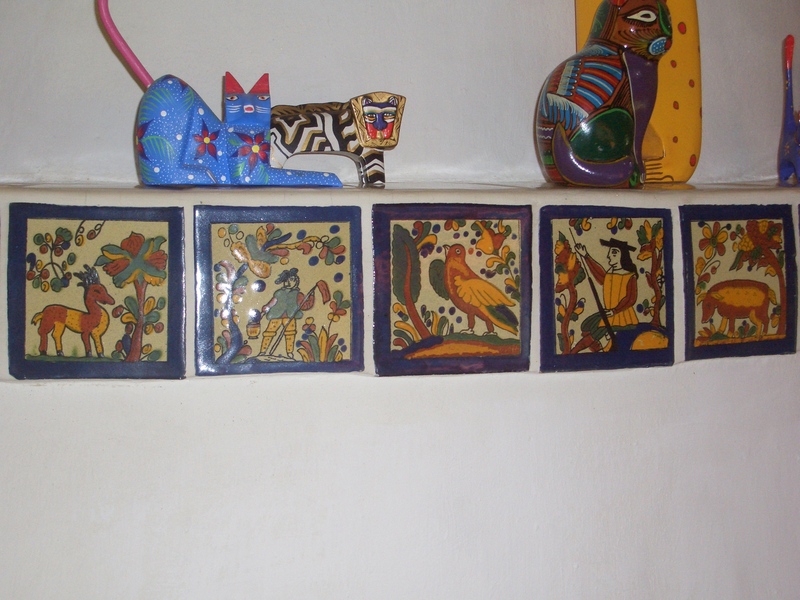 They are all hand-painted designs on clay tiles; all the imperfections add to their beauty! 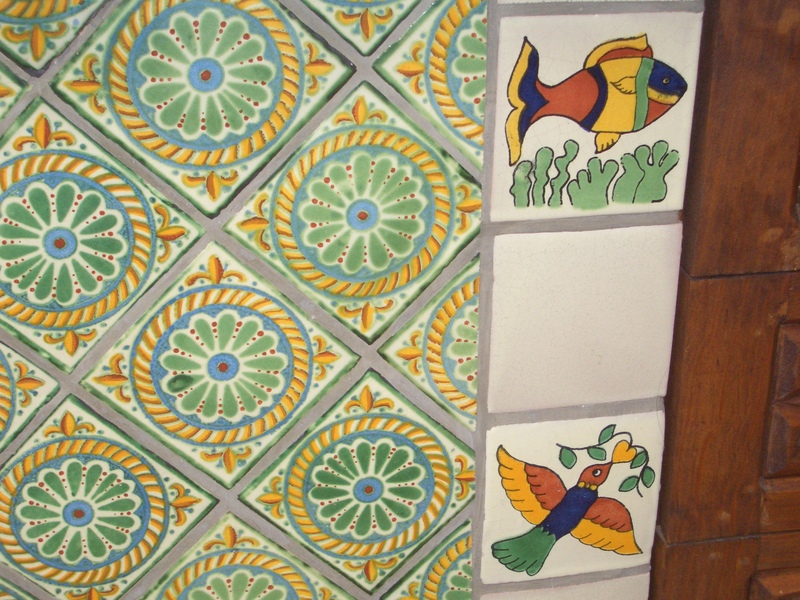 It’s difficult to pick out my favorite tiles, but these are right up there! 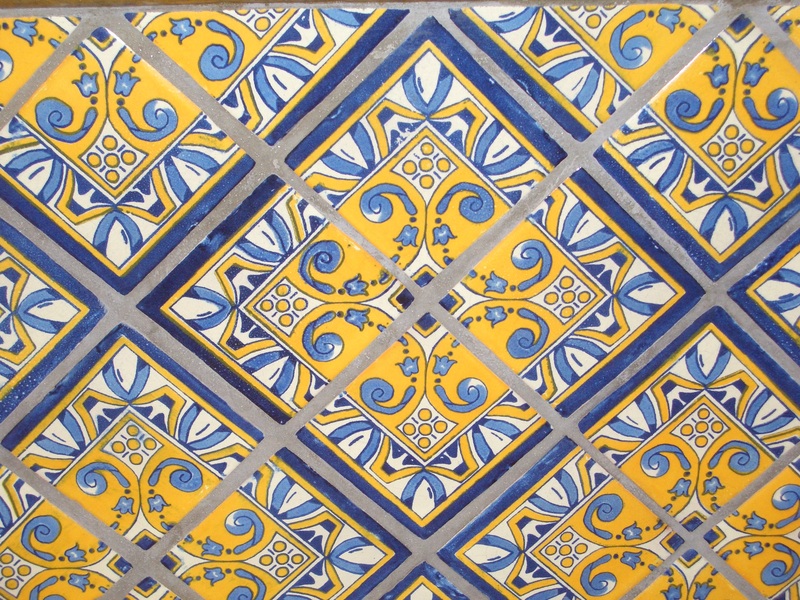 These interesting tiles come from antique designs. They form a shelf on the beehive fireplace in the living room. 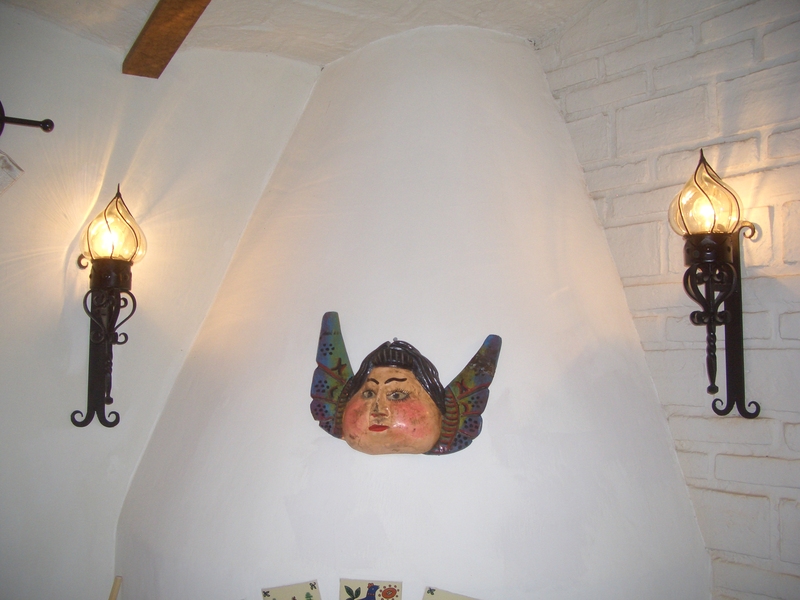 A close contender for my favorites are these fanciful bird tiles that we installed around the curved opening of the beehive fireplace in the master bedroom. 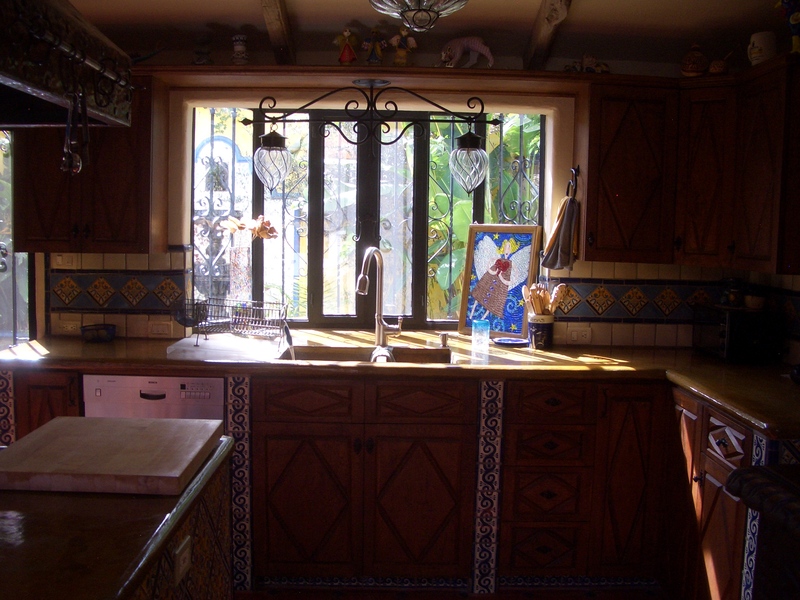 These tiles we used in the kitchen form a pattern with four tiles, and we installed them on a diagonal. 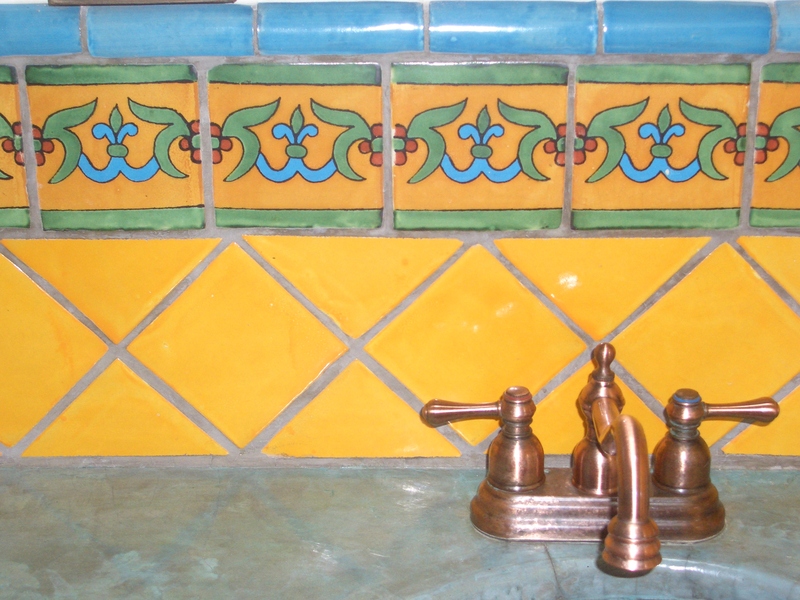 But they also work well on their own, which is shown on the backsplash. 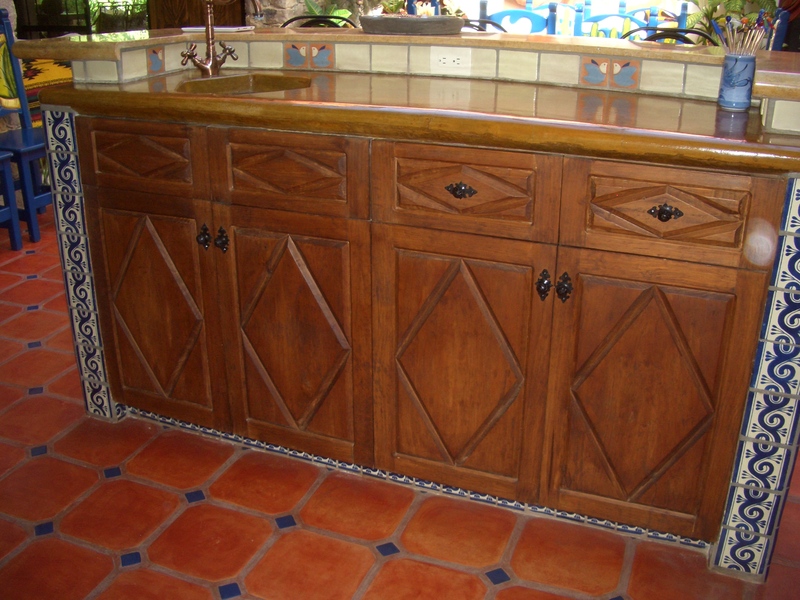 Also in the kitchen are these continuous-pattern tiles that work well on the supports around the lower cabinets. 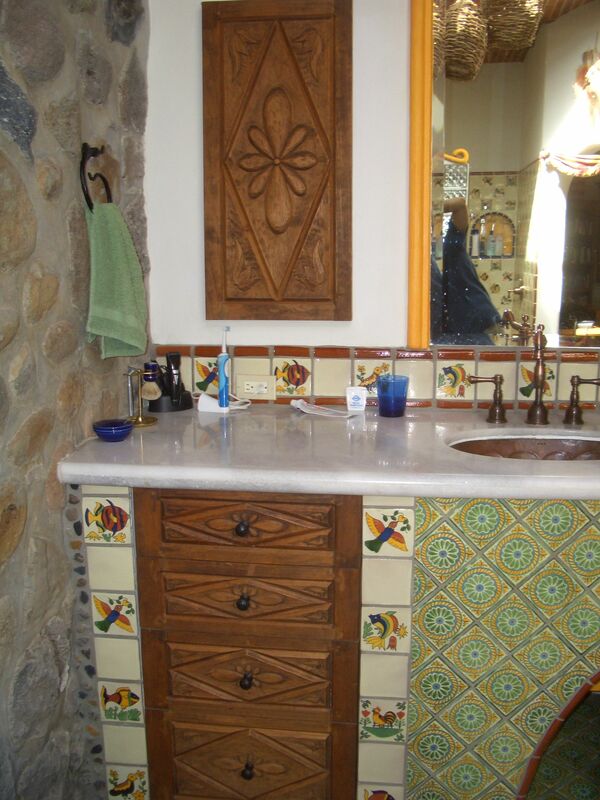 In our master bathroom we used a geometric design tile with colorful accents, and with bird and fish tiles in the large shower area and around the sink area. 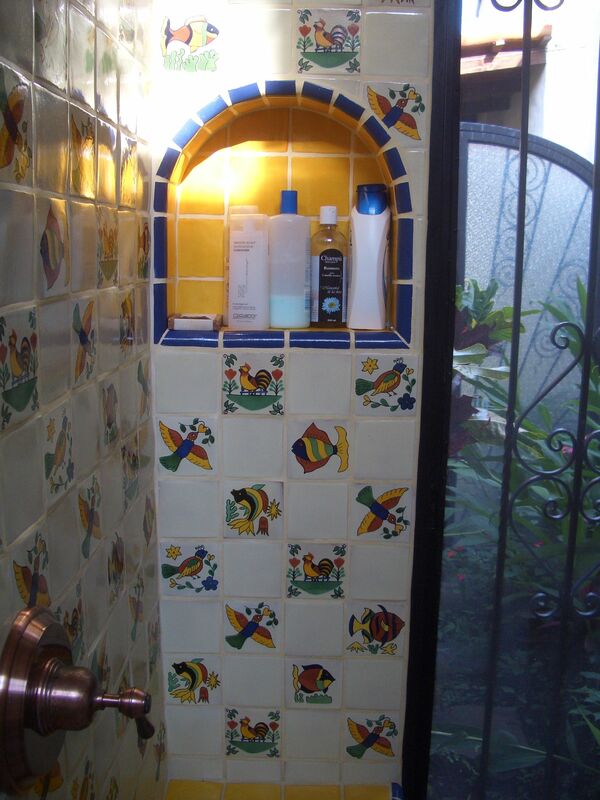 The hall bathroom has cheerful yellow tiles with coordinating trim tiles and turquoise edge pieces. 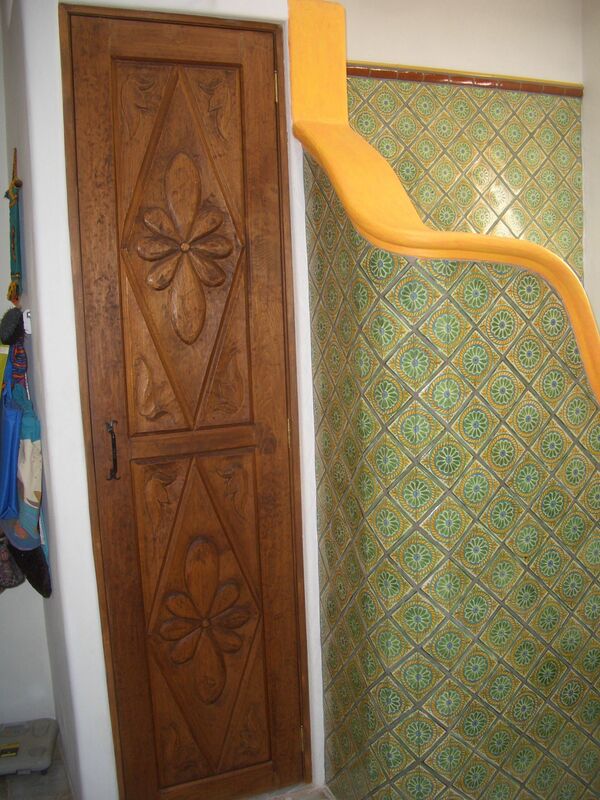 The spare bedroom bath has turquoise field tiles with a coordinating edge tiles and matching bathroom accessories. 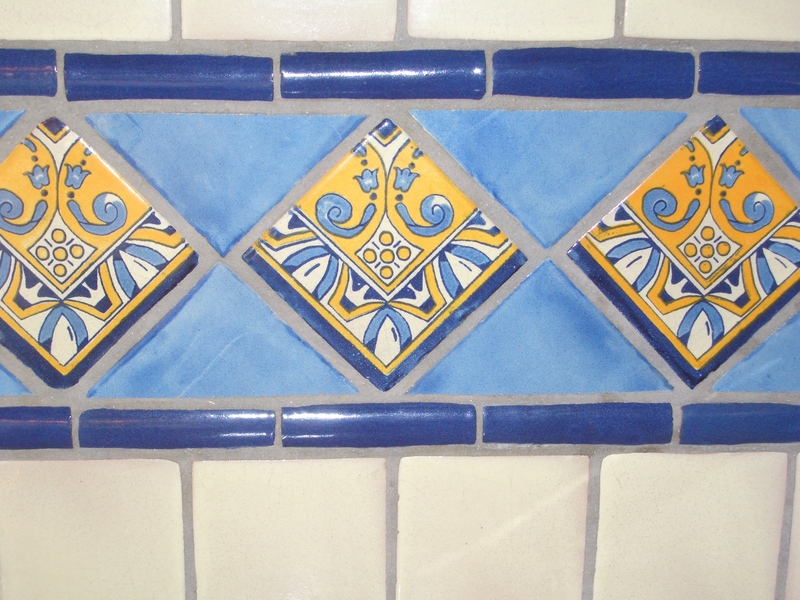 There are lots more Talavera tiles – in the art studio, casita, on stair risers, etc. – that you’ll have to get glimpses of in other pictures! To get all the details of our house for sale in beautiful Ajijic, Jalisco, in the mountains of central Mexico on Lake Chapala, visit www.casamosaica-ajijic.com. We’ve just lowered the price on our wonderful garden estate in Ajijic on Lake Chapala from $690,000 to $599,000. Maybe the new price will make our property affordable to someone who really loves our house!?! 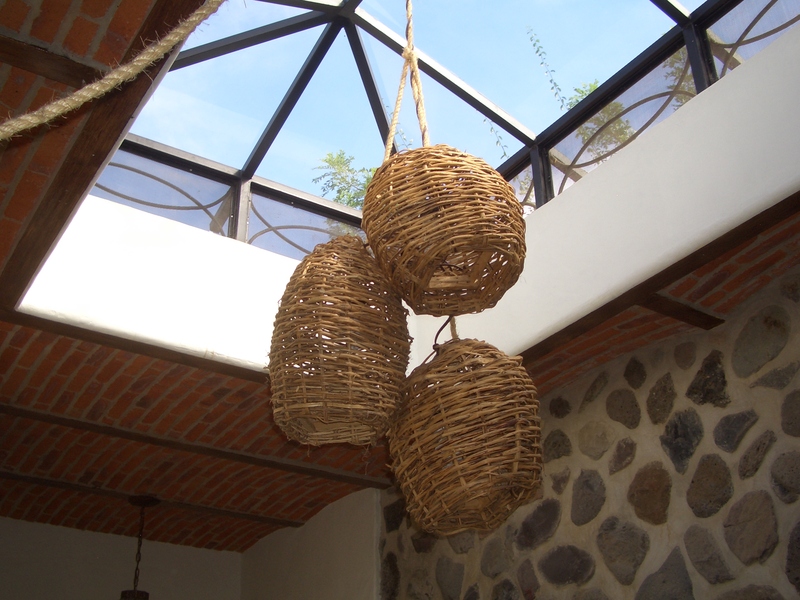 Take a look again at our website at www.casamosaica-ajijic.com. 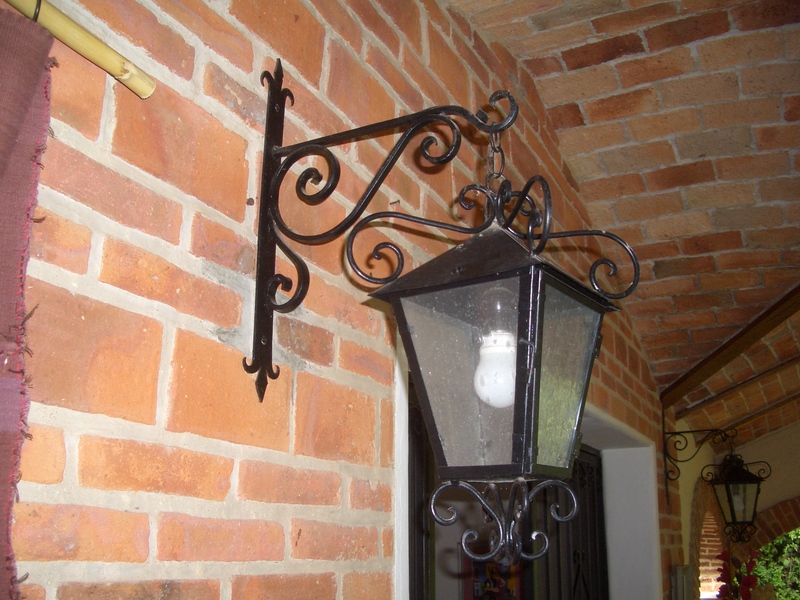 I found these lamps and brackets, of which we have 10 scattered around the exterior of the main house, in Patzcuaro. They came without glass, so I bought some textured glass and cut and installed it in all the lamps. 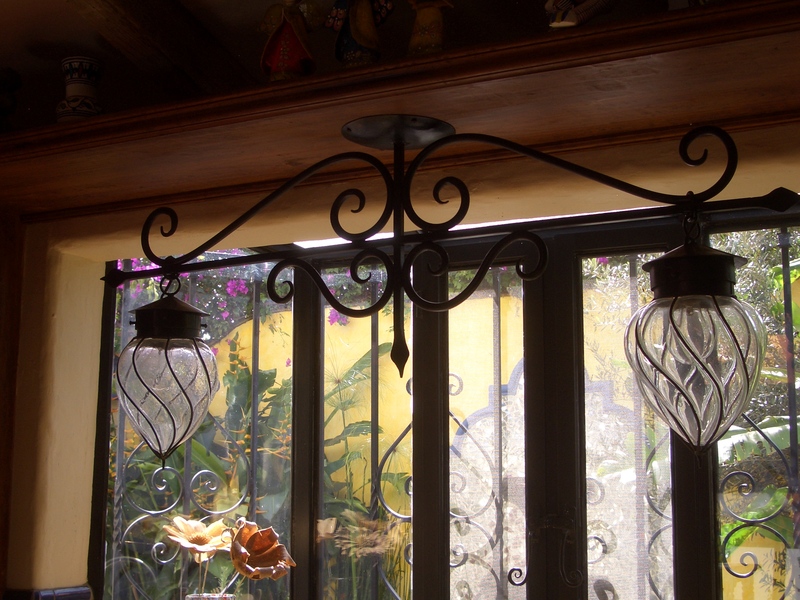 There are two of these amber-colored blown-glass and iron lamps hanging on the large terrace of the main house. 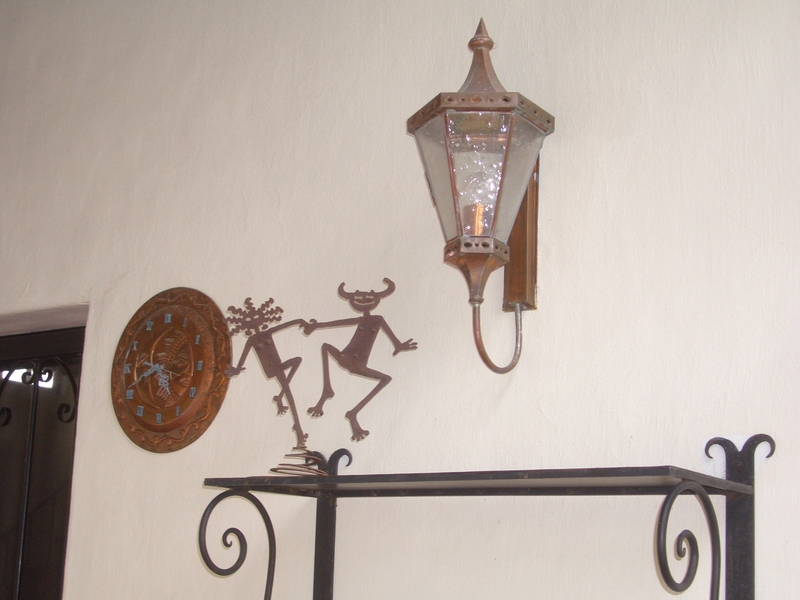 We found this cute lamp (as well as the clock in the photo) and a couple others like it in Santa Clara del Cobre, the copper town near Patzcuaro. 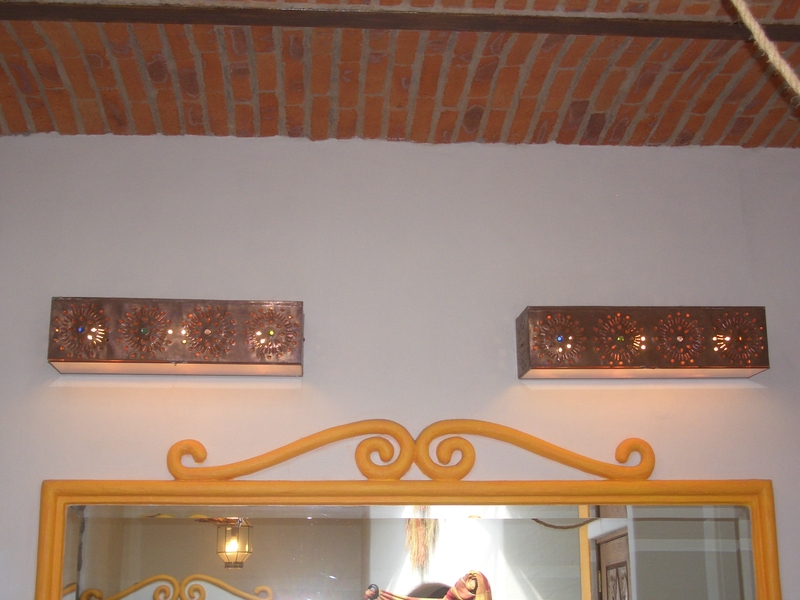 These two copper sconces with a nice patina we found in Tlaquepaque. 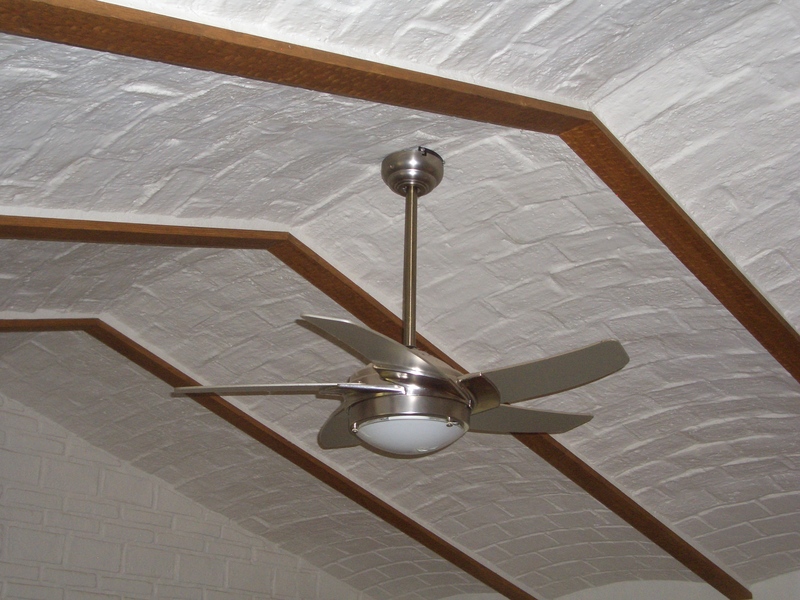 This last pic is the ceiling fan in our master bedroom. It’s not Mexicano, but it’s got a sleek modern style that we like. To get all the details of our enchanting garden estate for sale in Ajijic, Jalisco, Mexico on Lake Chapala, visit www.casamosaica-ajijic.com. Make sure to click on the pics to get the larger version. 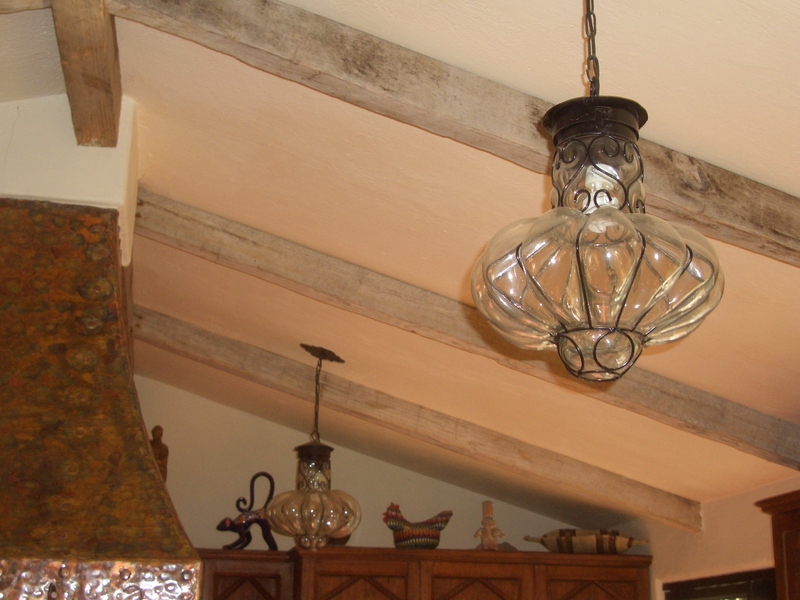 This first shot is of a couple sconces on either side of the master bedroom fireplace that I designed and a local iron worker hand-forged. 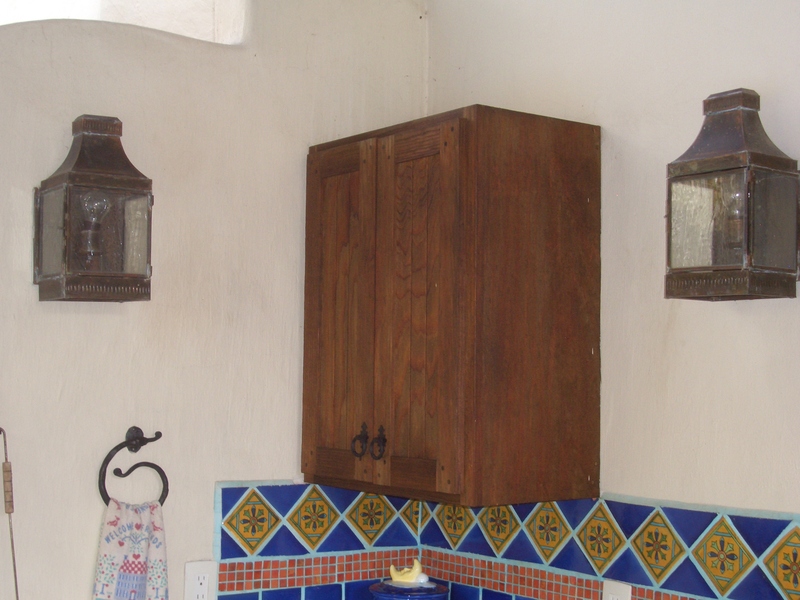 There are about a dozen of these lovely sconces scattered around both the main house and the casita. 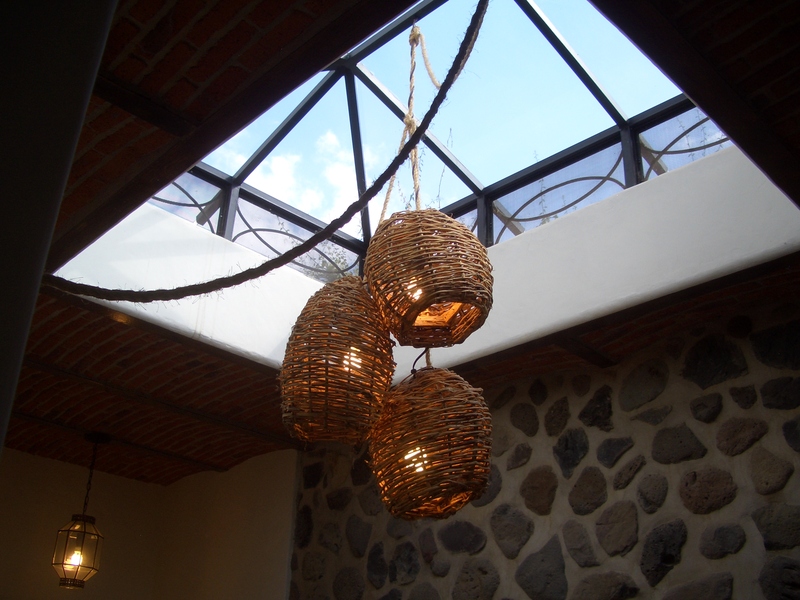 These wicker basket lights are hanging in the skylight over the copper tub in the master bathroom to add a special ambiance to that space. In the bottom left corner of the photo is the hanging copper lamp in the large master shower. This next photo shows the copper vanity lights in the master bath with perforated designs and marbles inserted in them which sparkle when the lights are on. Together with the copper faucets and sinks and tub, they complete the ensemble. 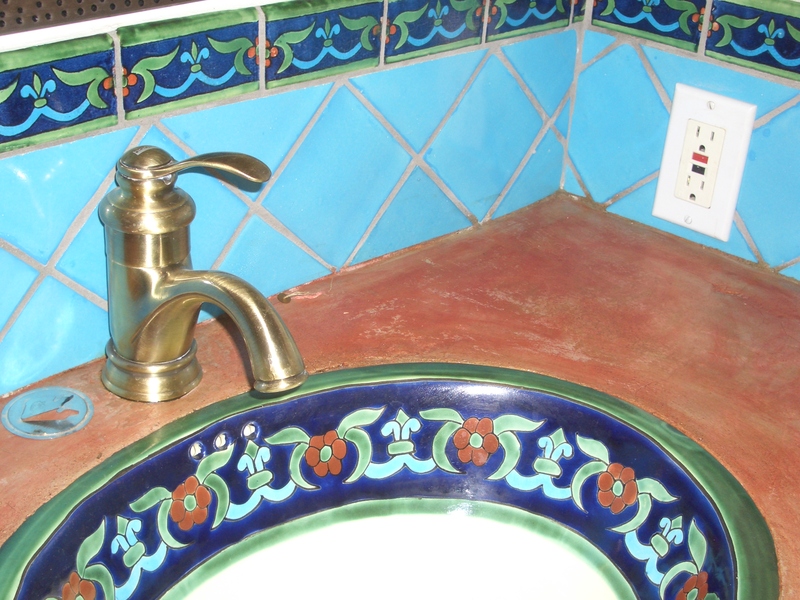 These two copper lights with cutout details are in the hallway bathroom to complement the colorful Talavera tiles and copper sink. 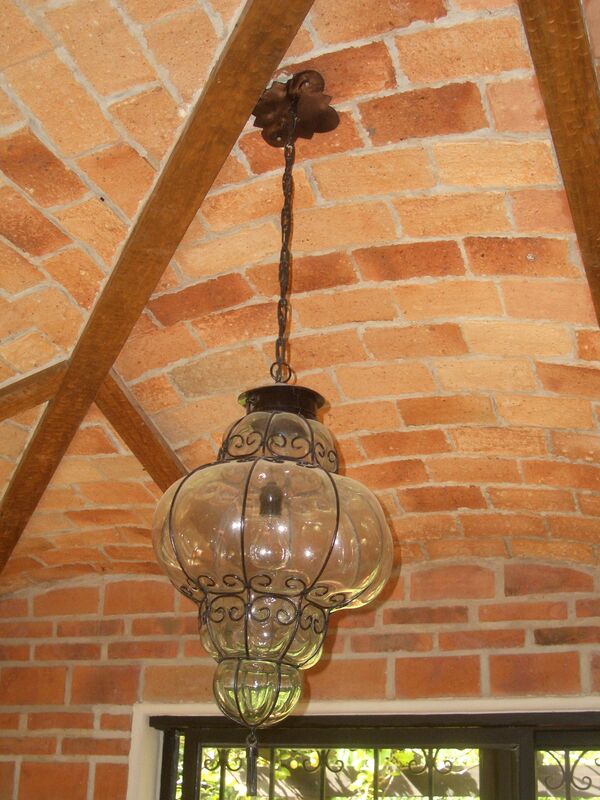 Next is the darling little copper and beveled glass ceiling light in the house’s spare bedroom en-suite bath. Last for now is the hallway light in the bedroom wing of the house, a beautiful amber blown-glass lamp with ironwork details. 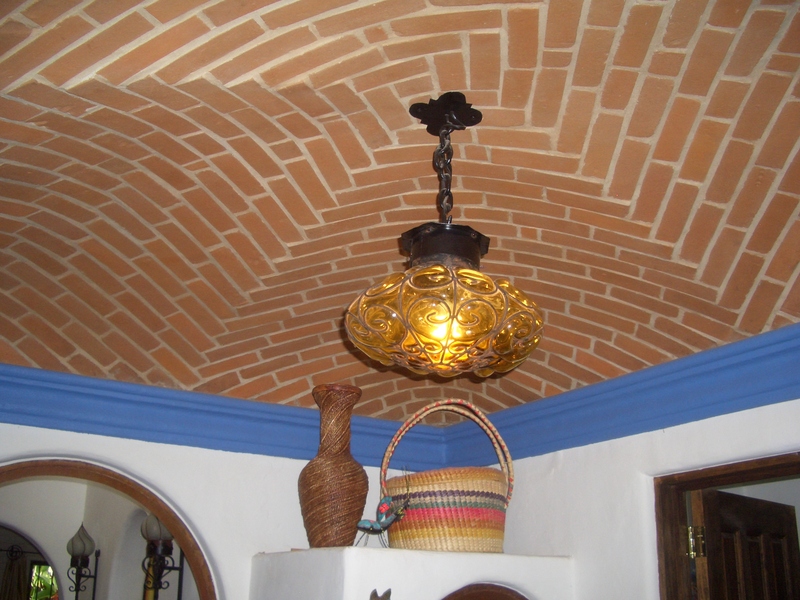 You can also see in the photo the fancy brickwork boveda ceiling and molding around the edge. 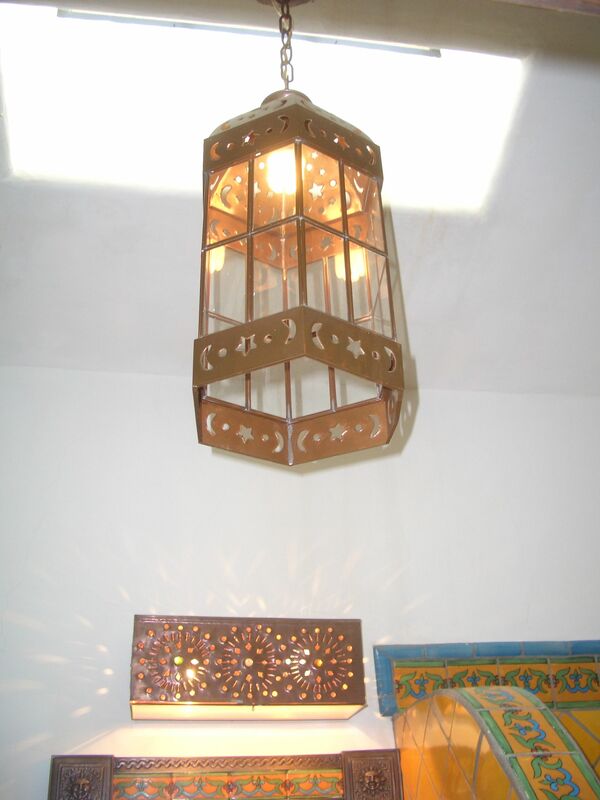 There are more light fixtures to go, which will come in a later posting. To see all the pictures and get all the details of this fabulous property for sale in Ajijic, Mexico on Lake Chapala, visit www.casamosaica-ajijic.com. 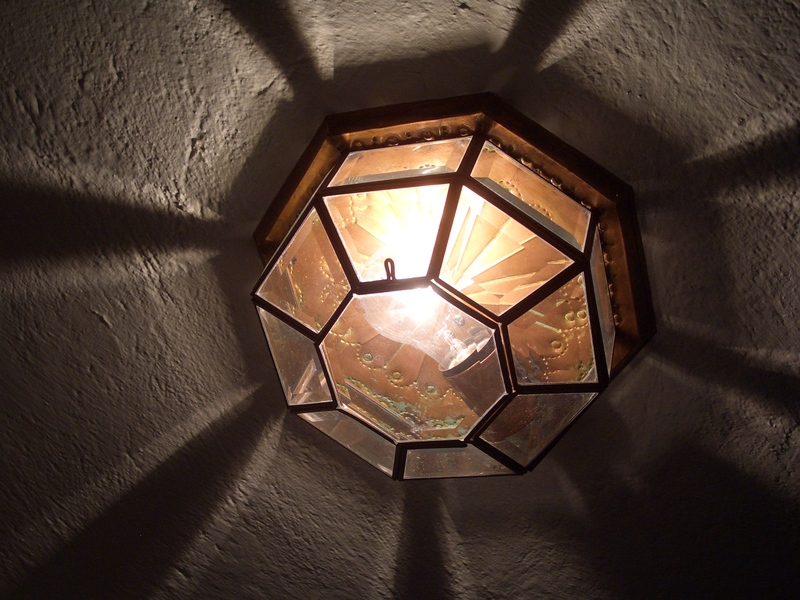 There are so many artistic and interesting light fixtures, I have to show them in more than one posting. 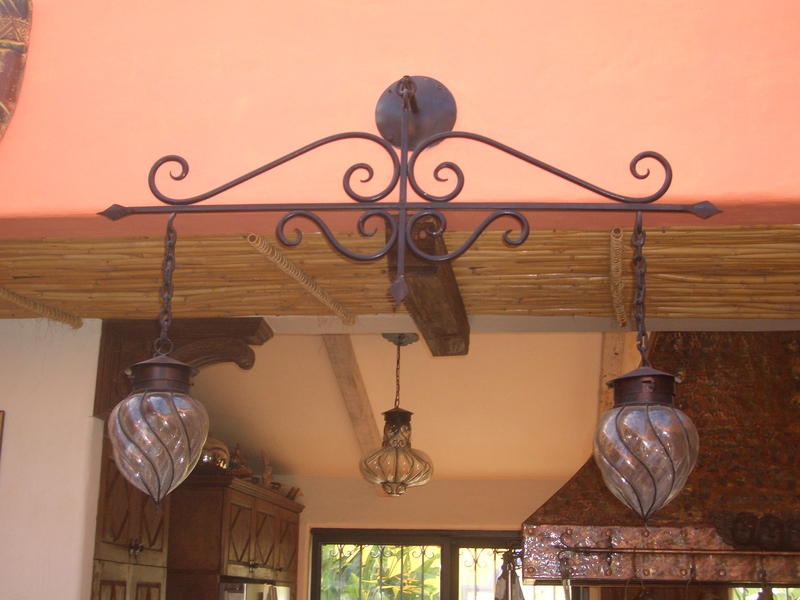 There are blown glass and iron ones, wrought iron ones with and without blown glass shades, copper ones, and some were designed by me and custom-made by local iron workers. 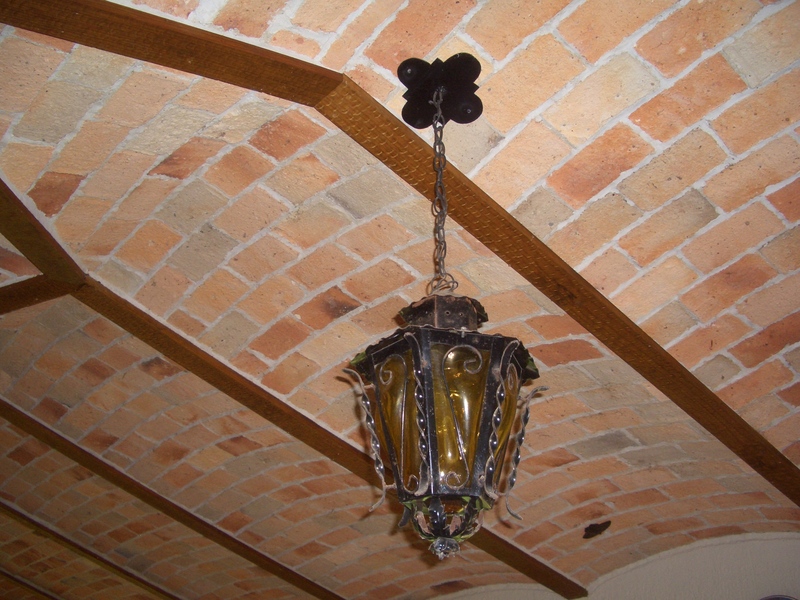 In this posting are photos of the light fixtures in the kitchen and adjoining rooms – the atrium and dining room. More will follow in another posting. To find out more information about this beautiful garden estate for sale in Ajijic, Jalisco, Mexico on Lake Chapala, see our website – www.casamosaica-ajijic.com. Click on any pic to get the large size and see all the details! 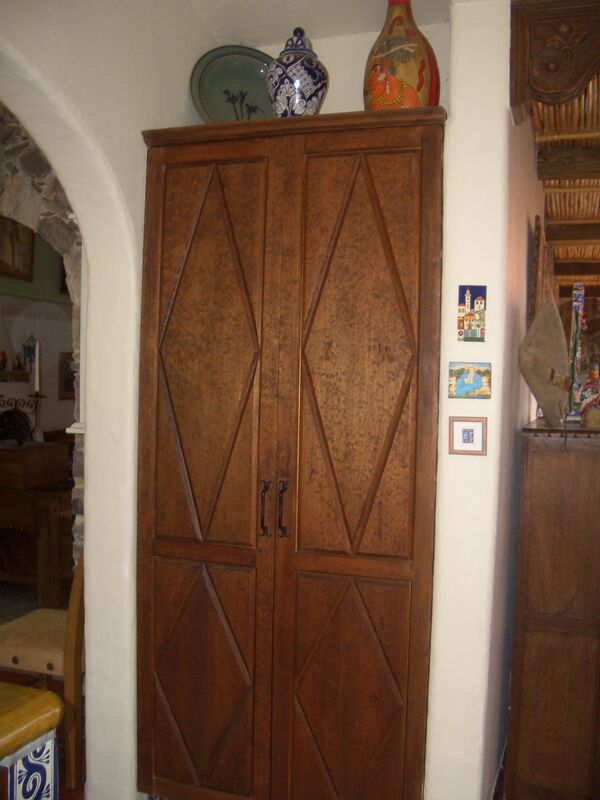 We found a wonderful cabinetmaker who also does wood carving, so we had him do all the woodwork in the main house – kitchen cabinets, bathroom cabinetry, office drawers and shelves, closet doors, library shelves and cabinets, even our closets! 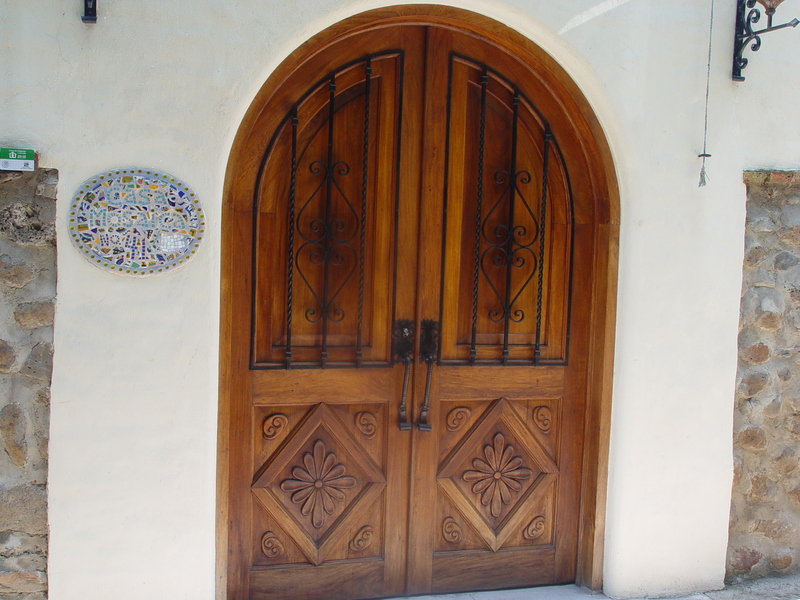 And it runs in the family – we had hired his brother earlier to build and carve our gorgeous arched double entry doors. 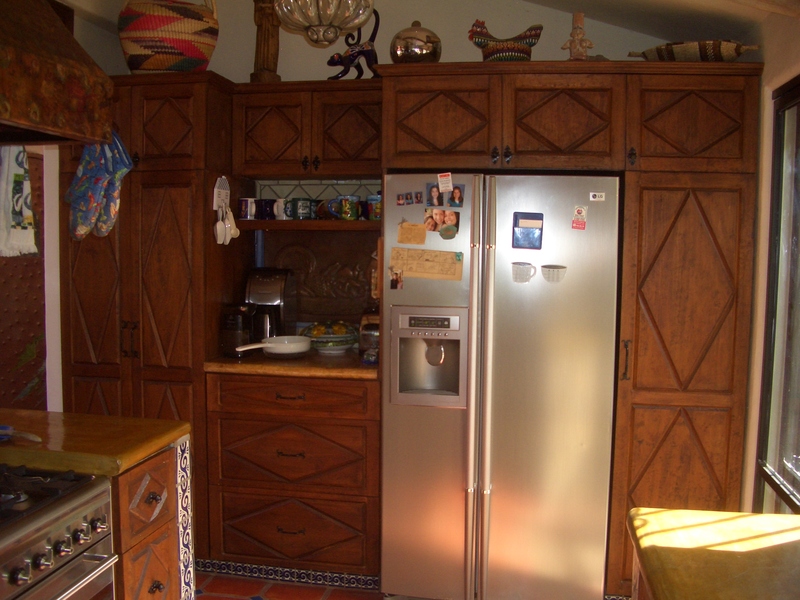 We chose not to have hand-carved details on the kitchen cabinets to make them easier to keep clean, although they still have a nice diamond-groove detail. 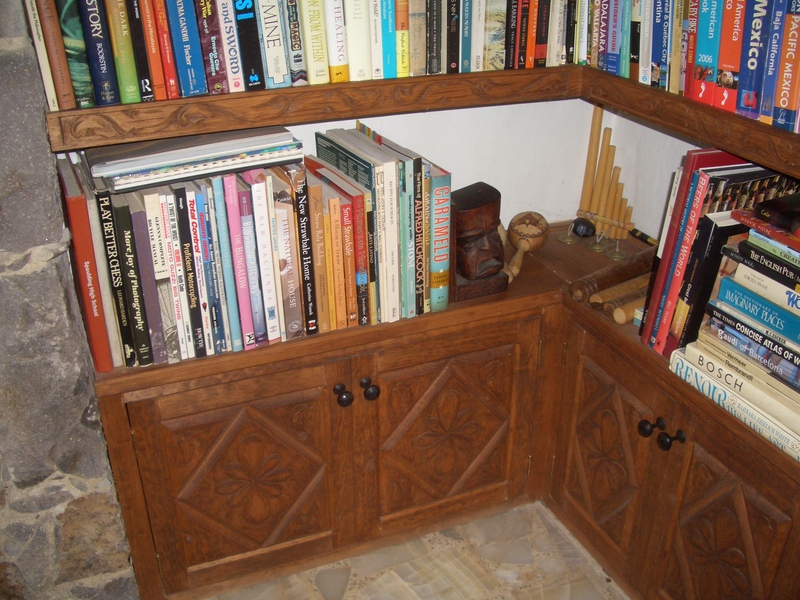 But everywhere else we have lots of beautiful hand-carved details. 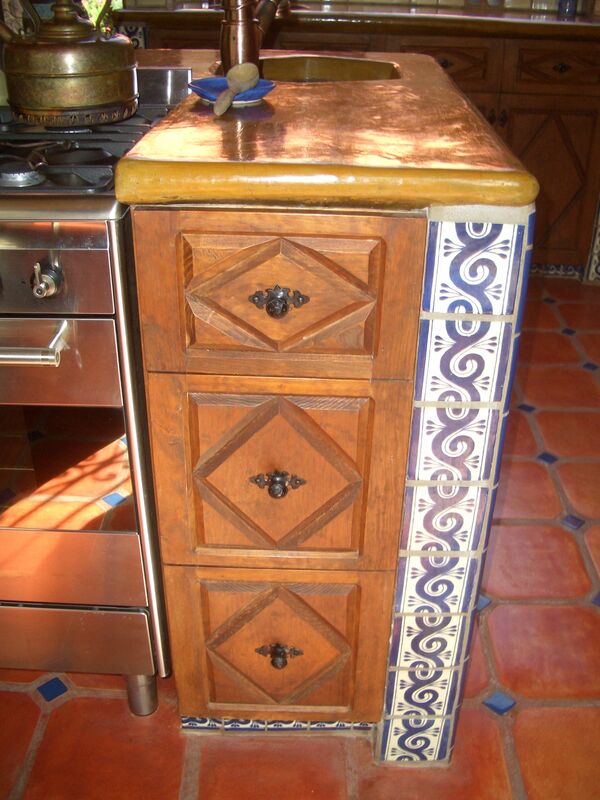 To stay with the Mexican style, we used wrought iron hardware to enhance the beautiful cabinetry. There are so many examples, this is just a sampling! 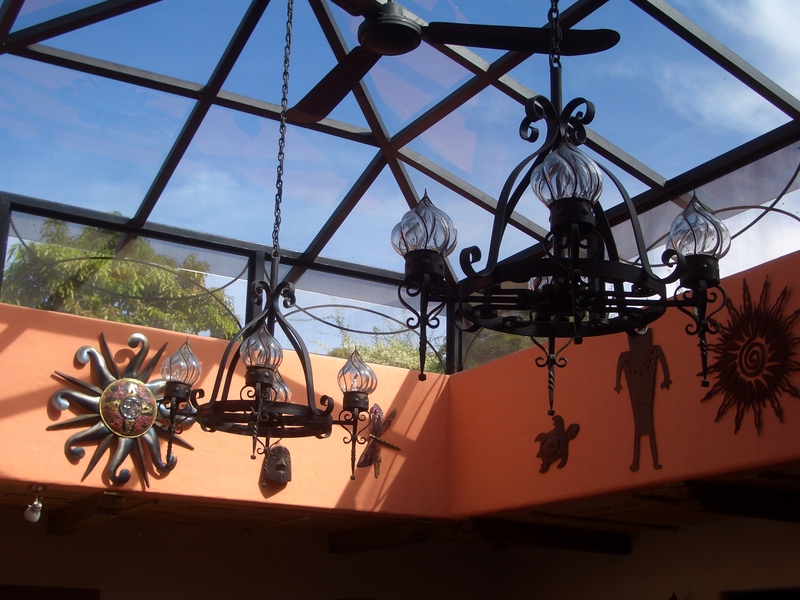 To see lots more details and get all the info on this beautiful traditional Mexican-style garden estate for sale in Ajijic, Jalisco, Mexico, visit our website – www.casamosaica-ajijic.com.